Happy weekend, everybody! I hope all of you guys are enjoying the winter (unless you're stuck in the blizzard destroying New England, in which case...brrrr.) If it's any comfort, today's free music download should help thaw your spirits. Hailing from Madrid, Spain, six-piece group capucha released a FREE debut EP last October. The band exists in a nebulous space between indie and post-rock, its sound refreshingly stripped-back and intimate but its compositions demonstrating a mastery of tension and climax. It's a balance the band pulls off well: this is an ensemble without a weak link. While songs like "hay mucho amor" (which Google Translate tells me means "much love") build to crushing walls of sorrow, weeping slabs of guitar complemented by a robust string section, lead vocalist Roberto Perez reins them in from melodrama with his smooth, melodic voice. On the other hand, "nada que puedas hacer" ("nothing you can do") makes a hell of a closing statement thanks to the fantastic instrumentation, understated when playing against Perez' pathos but growing more ravenous with each passing minute and building to a ferocious climax that will elicit reactions from even the most jaded post-rock junkies. 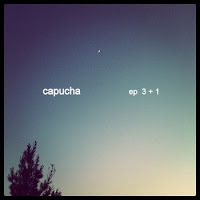 Just as the album's cover depicts a transitional period, something between a sunset and nightfall, so does capucha's music, yielding results as moving as they are creative. You can download this EP for FREE on the band's Bandcamp page and find more info on its Facebook page.